There are things going on here that have been going on since I moved in. I have felt, seen, and heard things in this building that have changed my mind about the word "haunted". I hear glass breaking...telephones ring...horses...and the sound a hammer would make if struck against an anvil. (I have since learned that years ago there was a livery stable next door.) I hear whispers and the sounds of giggling. Several weeks ago...a light came on down the corridor..I was barely asleep. I got up to investigate, found nothing, so I went back to my bed. Moments later I heard the banging of the fire-escape door...someone was trying to get in! I shudder to think what might have happened, had I not gotten up to investigate the light coming on by itself. I think it was a warning. I have taken lots of photos from the start of my project to document my progress....the film from the first two disposable cameras came out black. The former church feels reverent to me....a man in a black coat is often seen by visitors. I hear an occasional cough...or a baby cry....and often I hear whispers. I just had impulses. 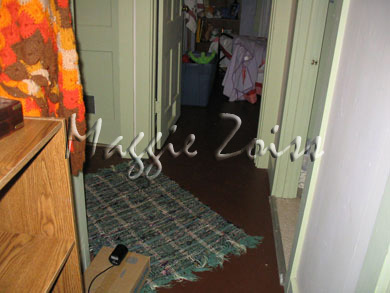 When we first went into the house, I wanted to go back to the back of the house and towards the kitchen. I don't know why I did...but I did. I found out later that there was supposed to be the ghost of a little boy back in that area. I returned to the area several times but did not encounter anything. Picture from a digital camera revealed nothing unusual. 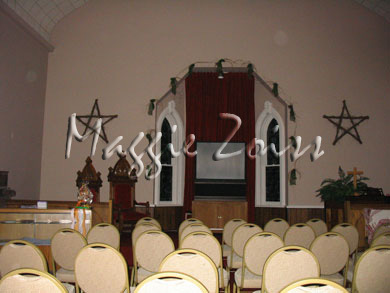 When we first went into the church, I was struck by the large stars on the walls. I immediately thought of pentagrams. 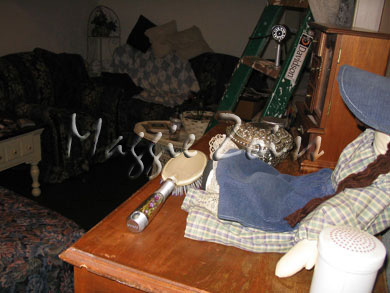 It took me a few seconds to get the "template" of Wicca out of my head so that I could view the area without prejudice. I walked around the floor area without incident however, when I came to the elevated area where the minister would have been, I got the impression that I should not be up there. I am chalking that emotion up to the fact that as a recovering Catholic I felt a bit sacreligious going up there even though there was a TV and DVD player up there. When I found out later from the owner that the church had not been desanctified, I got a chill. I sat in the back of the church and closed my eyes. I felt as though there were a hundred people in the room...not in a negative claustrophobic way though. It just felt crowded or busy in there for lack of a better description. Later, others noted to me that the church was thick with residual activity. I don't know whether or not to chalk that up to common sense. An old church should be full of residual energy and therefore, I may have imposed that thought into my assessment. Finally, sometime after sunset I was in the church and noticed the windows were dark. The owner had previously stated the the ambient light from the street lights always provided some light. Perhaps the streetlight does not go on in a predictable manner. Both my wife and I noticed the darkness. Neither of us experienced any negative impressions or emotions. I would really be surprised if any unpolluted evidence was captured because of all the foot traffic going on in the area, during the investigation. The land first belonged to Tecumseh, Shawnee Indian Chief. The land around the area was free of Indians and settlers began building homes there around 1848. When the railroad was constructed from Louisville to Indianapolis, John Hamacher founded and surveyed the town and named it Haysville. Mr. Crothers was a depot agent of the railroad at that time, and proposed to build a good depot by the Railroad Company IF they would honor him by changing the name of the town to honor his name. It then became a thriving business town and an important shipping center. At one time, it ran the largest stave factory in the state. The original plot of the town consisted of 39 lots being laid off from the railroad. Today, at the turn of the Twenty-First Century, this small community has pulled together to save the buildings for future generations. 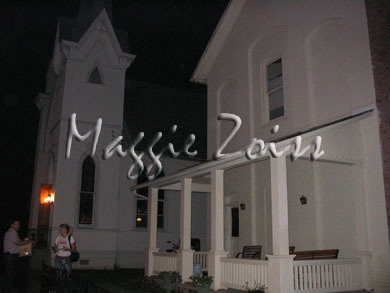 The former church has since been renamed "Hamacher Hall" in honor of it's founder. The Heritage Foundation, comprised of a handful of businessmen purchased the 135 year old, gothic revival style building with funds generated from ice cream socials, memberships, dinners, bake sales, holiday home tours, and other small town events. 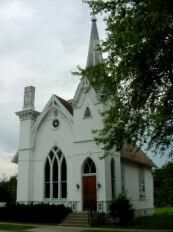 Along with the historical church, the GCHF purchased the former church annex building. This building has a history that pre-dates Hamacher Hall. It was originally built in the late 1850's (pre-CIVAL WAR) as the "Old German School". As one of the town's first buildings, over the years, it has served as a school, a post 'drop off', a telephone exchange, the licence branch, and then by the church for sunday school classes, church offices, parsonage, and food bank.